Below is County Map of El Dorado in California showing the boundaries, roads, highways, towns and much more. The County of El Dorado is located along the eastern border with Nevada in Northern California. The county extends over an area of 1,805 square miles. Lake Tahoe, the largest alpine lake in North America, forms most of its eastern boundary. 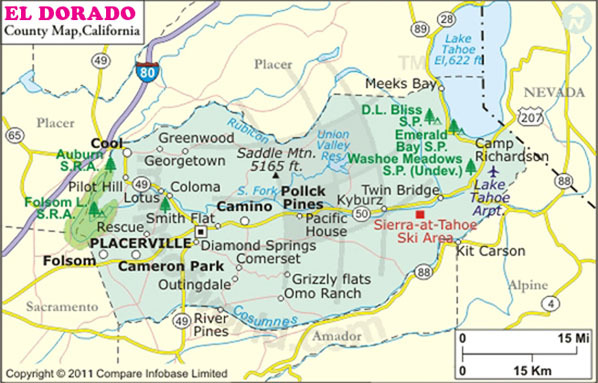 The northeast portion of the County lies under the Lake Tahoe basin, while the rest of its area is in the western slopes of Sierra Nevada range. The present-day county was once known as the historic Gold Country during the California Gold Rush. It also was on the line of the short-lived Pony Express that connected California to the eastern states. The county seat is Placerville (a Gold Rush town) and the largest city is South Lake Tahoe. El Dorado Hills, Cameron Park, Diamond Springs, and Pollock Pines are other settlements in the county. The Heavenly Mountain Resort, with 97 runs and 30 lifts, is one of the most popular resorts in the Lake Tahoe area. The Folsom Lake State Recreation Area – near the city of Folsom – is widely used for activities such as hiking, camping, and biking. The Marshall Gold Discovery State Historic Park, Vikingsholm, Eagle Falls Trailhead in Emerald Bay State Park, and Echo Summit are popular destinations in El Dorado County. Lake Tahoe Airport (TVL) is used for general aviation. US Route 50, State Route 49, and SR 89 are major highways in El Dorado County.